Defence is a Government job sector where more than half of the Indian population seek job. To fulfill the dreams of the aspiring candidates Government of India and its various divisions have issued the recruitment notification to fill up 7000+ vacant government jobs. There are 7140 positions lying vacant under Indian Army, Assam Rifles, National Defence Academy, Military Hospital, ITBPF, Ordnance Factory, Indian Air Force wherein, Ordnance Factory itself contribute for 6948 vacancies. The job notifications are issued to hire candidates for the posts of Clerk, PA, MTS, Ward Sahayika, Group ‘C’, Additional Judge Attorney General and many others. Thus, candidates who are 10th Pass can apply for Ordnance Factory jobs and there are varied qualification requirement according to the concerned posts. Interested and eligible candidates can apply for Defence Jobs online/in the prescribed format along with required documents on or before the last date of application. 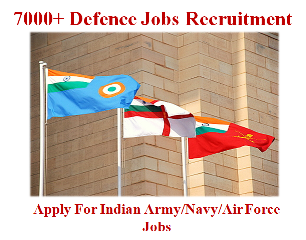 Please take a look below for 7000+ New Defence Jobs 2017 for 10th Class Pass and Others. Take a look below for all Defence Jobs Detailed Advertisement.